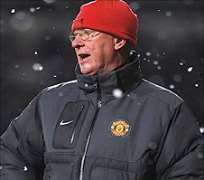 Manchester United manager Sir Alex Ferguson believes the Premier League title race is now down to three teams. “I don't think there will be anyone outside ourselves, Chelsea or Arsenal,” said Ferguson, whose side top the table by two points with games in hand. United could extend that lead when they host Sunderland on Boxing Day, with the second-placed Gunners taking on fourth-placed Chelsea on Monday. Ferguson added that he feels Manchester City and Tottenham will fall away. The Scot believes third-placed City and Spurs, in fifth, will be hampered by their European commitments. With the season nearing its halfway stage, the race to become Premier League champions is developing into arguably the most open one for years. The top four sides are separated by only three points as they enter the busy Christmas period. Victory against Sunderland for United at Old Trafford on Saturday will add to the pressure on their rivals, and a draw between Arsenal and Chelsea would cement their place at the summit. Which teams do you think are still in the title race? But it is a quest Ferguson feels is beyond both both sides. “I know Harry [Redknapp] is talking up his chances at Tottenham but they are involved in the Champions League, which is a new thing for them,” said the Scot, who turns 69 on New Year's Eve. “If they get through the next stage it is not easy to manage European competition at that level and doing your league programme, plus FA Cup ties. Usually experience gets you through. Bottom team West Ham – two points adrift – have won only twice this season and travel to Fulham, who are in 17th spot only three points above their London rivals. Wolves, in 19th, host Wigan, the team one place and one point above them. Hammers boss Avram Grant, encouraged by a battling 1-1 draw at Blackburn last weekend, insisted it was up to the experienced players in the squad to help boost their chance of survival. With teams in England facing four fixtures over a 10-day festive period, the call for a winter break – something enjoyed in Italy, France and Spain – is once again being demanded by a number of Premier League bosses. Ferguson has been a long-time supporter of such a rest for the players, and Man City manager Robert Mancini and West Brom head coach Roberto di Matteo are the latest to join a growing band of managers who support the idea. “We're not living in the Middle East or Africa. We live in England, in northern Europe, so let's have a winter break,” Di Matteo said. “In March we have two games. Can we not put another game in there, even though it's an international break? Why not put one or two at the end of May when the pitches are beautiful and people will flock to the stadium. One manager who does not feel the fixtures should be interrupted is Wolves manager Mick McCarthy. “I've never wanted a winter break at all,” he said. “Fans love going to a game on Boxing Day and I've done it all my life as a player and manager. “I've trained Christmas Day and you just get on with it. I remember when I was at Sunderland a few years ago and over 40,000 turned up on Boxing Day against Leeds.